I have a number of things in progress right now — a queen sized quilt for my own bed, using Simply Color and big pinwheels, a Kitchen Window quilt that I’ve had cut for ages and can’t seem to get myself to piece, not to mention smaller projects. 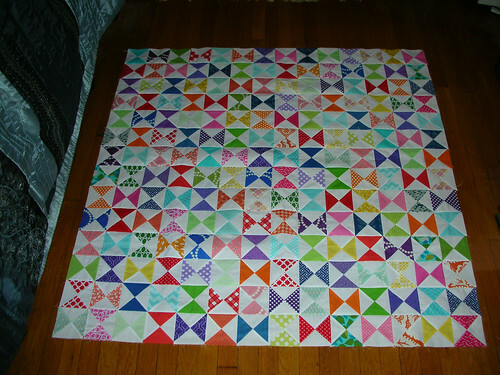 But the one I’m working on is a baby quilt for a neighbor’s baby girl. The hourglasses are 3.5″ finished, and there are 196 of them — 14 x 14. I’ve got about 70 more that I didn’t use, so I’ll have to figure out what to do with those one of these days. I used 5″ squares, made 4.5″ half-square triangles, and 4″ hourglasses. Sewn together, they look at lot smaller than they did — 13 seam allowances adds up! The crazy thing is, I loved piecing this thing. You’d think I’d be tired of hourglass blocks, but I’m not at all, just looking forward to the next time I have a project that needs some. It looks fantastic! Great job. What a beautiful quilt for a lucky baby girl! This is beautiful and will be a perfect baby gift! Such a cheerful quilt. I love the colors with white. 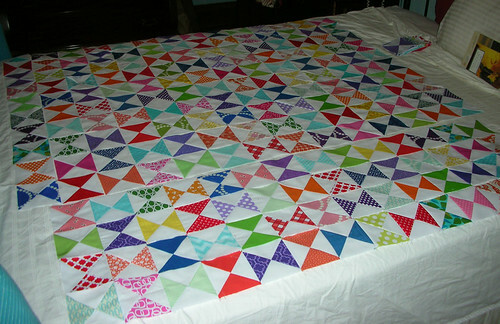 Love you bright happy quilt. Next Next post: A three-finish Friday!